Matthew bought 250 apples, and 10 of those apples were bruised. What percent of apples were bruised? Julia has $500.00 to start an investment portfolio. 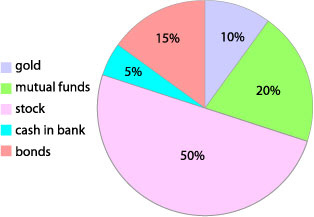 Use the circle graph to find how much money she invests in each type of investment. How much money did Julia invest in gold? How much money did she invest in mutual funds? How much money did she invest in stocks? How much money did she invest in bonds? How much money did she put in the bank?